The drug Tablet is by far the most widely used of all dosage form. Tablets are supplied in many shapes, sizes, and colors. By definition, a tablet is a solid medicated dosage form with or without suitable additives made by compression or molding. Suppose you select a bottle of 250 aspirin tablets which has a label stating that each tablet contains 325 mg of aspirin. How can you be confident that each tablet contains 325 mg of aspirin? The United States Pharmacopoeia/National Formulary is specific in stating standards for the manufacturing of tablets. Thus, when a physician prescribes two 325 mg tablets of aspirin, the patient will indeed receive 650 mg of the drug. Liquid preparations are measured much less accurately; where one teaspoon may contain 5 mL, another teaspoon may contain 4 mL. Some drugs are more stable in tablet form than in solution or suspension form. Hence, supplying the medication in tablet form ensures that the drug will have an acceptable period of stability. Of course, the expiration date of any medication should be checked before that medication is dispensed. Although tablets are widely used, they are not without their disadvantages. Sometimes it is difficult to predict the actual amount of active ingredient absorbed into the bloodstream. For example, if a tablet fails to disintegrate properly in the GI tract, one may not receive the therapeutic dose prescribed. Also, very young or elderly patients may be unable to swallow tablets, making it necessary to prescribe another less desirable dosage form. Drug tablets also contain ingredients other than the active ingredient listed on the drug label. The other substances are to help ease digestion, or keep the dosage together, etc. Active Ingredient - The active ingredient is the chemical substance intended to produce a desired pharmacological effect. 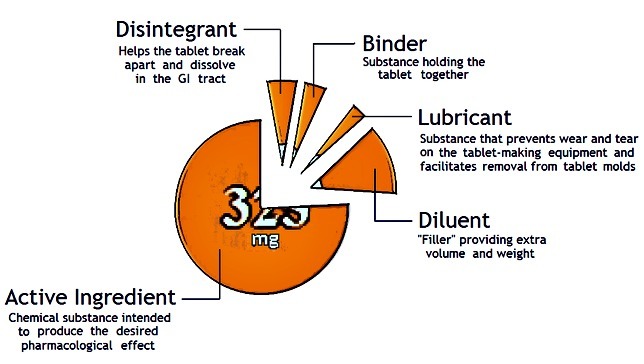 Diluent - The diluent is "filler," providing extra volume for the tablet. Notice the tablets to the right. 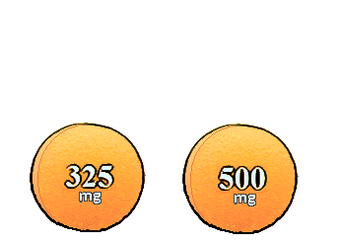 One is labeled 325 mg while the other is labeled 500 mg. How can this be since they are the same size? Does this mean the manufacturer made a mistake and put too much active ingredient in the 325 mg tablet? Probably not. Much of the extra weight is diluent. Binder - The binder is the substance that holds the tablet together. Disintegrant - A disintegrant helps the tablet break apart and dissolve in the GI tract. Many disintegrants act by absorbing water and splitting the tablet into many small pieces. Lubricant - A lubricant is a substance serving two functions. First, to prevents wear and tear on the tablet making equipment; and second, to make it easier to remove the tablet from a mold. Drug Tablets may also contain additional ingredients such as sweeteners and/or coloring agents. There are many different types of tablets, each serving a specific purpose, being categorized based upon their use. The most common type of tablet is made by compression or molding and is intended to be swallowed whole. This type is used when the patient is able to swallow and the drug is not hindered by gastric juices. A chewable tablet is a tablet meant to be chewed before swallowing and may be used when the patient cannot swallow a whole tablet. Further, the chewable tablet is used whenever the tablet needs to be broken down before entering the stomach. Children's chewable vitamins are a common example. Extended action tablets are designed to release medication over a period of time. Since the active ingredient is released over time, the drug produces its desired effect much longer. Gastric juices can destroy a medicinal substance; therefore, an enteric coated tablet may need to be used. Enteric coating allows a tablet to pass through the stomach to be broken down and absorbed in the intestine. In addition, enteric coated tablets are used when the stomach might be irritated by a particular drug. When conditions exist causing a drug to be unstable in the stomach, or when a rapid onset of drug action is desired, tablets can be designed to be absorbed more quickly. For instance, effervescent tablets are designed to be dissolved in water, creating a solution which a patient drinks. Since there is a subsequent release of carbon dioxide, effervescent tablets should never be swallowed, thus preventing certain gastrointestinal difficulties. Buccal tablets are designed to be dissolved in the mouth between the cheek and gum. A sublingual tablet is dissolved under the tongue. Both the buccal and sublingual tablets are unique in that they are not absorbed in the stomach, but quickly into the circulatory system via the rich blood supply in the lining of the mouth. Nitroglycerin is a common example of a sublingual tablet. A lozenge, on the other hand, is a tablet designed to be slowly dissolved in the mouth or upper throat. Lozenges are used for their local effect. Many OTC "sore throat" medications are supplied in lozenge form. Tablets should not be touched by the hands when filling prescriptions. and should be dispensed in glass or plastic vials. A container with a tight seal will help protect the tablets from moisture. A child resistant container should be used to contain dispensed tablets. A capsule is a gelatin or methylcellulose shell of two varieties; the hard capsule intended to contain solids, and the elastic or soft capsule designed to hold liquids. Capsules have advantages over other dosage forms in that they are uniform and clean, and effectively mask the odor and taste of drugs as they provide an accurate dosage. Capsules provide a rapid release of medication in the stomach due to their rapid disintegration. Capsules are sized by universally designated numbers: 5, 4, 3, 2, 1, 0, 00, 000. The number 5 has the capacity of about 65 mg of powder (such as aspirin) and the number 000 capsule contains about 975 mg of the same substance. Gelatin capsules become brittle when they are stored at low humidity and they become soft, sticky, or liquid at high humidity. Consequently, empty gelatin capsules, as well as filled ones should be stored in a cool, dry place in tight containers. Capsules should be dispensed in glass or plastic containers that protect them from moisture and dust. Capsules that are adversely affected by the atmosphere should be in a tightly closed container and the patient should be instructed to keep the bottle tightly closed except when withdrawing a dose.